The power of beard compels you! For those without comedic tastes, the self-proclaimed experts at Wikipedia have an article about Beard. A beard is a sacred facial marking of great power, given only to the blessed few chosen by the gods. It is a powerful object of persuasion, allowing the wielder to bend women and lesser men to his will. The origins of the beard are varied and many, but all steeped in reverence for its awesome might. "And on the eighth day, God said, Let us make Beard in our image, after our likeness: and let it have dominion over the fish of the sea, and over the fowl of the air, and over the cattle, and over all the earth, and over every lesser man that creepeth upon the earth. 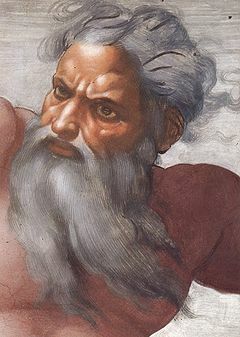 So God created Beard in his own image, in the image of God created he it; yet only male he created them, for the Lord God said, Behold, the woman posses wiles as a snake, to sway the minds of man to her whims: and now, lest she put forth her beard, and take also of his heart, and own him entirely: Therefore the Lord God withheld the beard from Eve. The Greeks held that Prometheus gave man the gift of the beard after plucking the beard of the gods from Zeus's chin in the night. Zeus, in a fit of rage, punished Prometheus by chaining him to a cliff, where eagles would tear out his beard every morning, only for it to fully grow back during the night. In the 1930s, Walt Disney claimed that he had invented the beard, and wouldn't let anyone else have one, not even his best friend Mickey Mouse. For a while Disney was successful in suppressing unauthorized beards, but then communists, who didn't believe in America, started overthrowing a number of small insignificant countries such as China and Russia, and letting anyone grow a beard, including children. Uncle Walt was most displeased by the communists' behaviour and asked his other best friend, Joseph McCarthy, to shoot anyone wearing a beard without his say-so. By the 1980s, beards were acceptable again and were sported by the rock group ZZ Top as an ironic gesture designed to screw with the heads of their impressionable middle-aged audience, thus they all had beards except Frank Beard who didn't. The other members, Dave Moustache and Roddy Eyebrows, were also lacking certain types of facial hair. This was considered pretty far-out in the 1980s. ZZ Top's big hit was "Legs", a tribute to their manager Peter Legs, who ironically didn't have any, only castors. Adam Lewis wants to be a pregant man. One of the few cultural taboos that sustains itself over history and geography is the cultivation of ginger hair. Up until the twentieth century, this display of such cadmium filamentous biomaterial was not tolerated outside of its owner's abode. In the second world war, it became necessary to utilise the gingers in the act of combat and thus 'heads of carrot' became more socially acceptable within the bounds of restricted length. Such is the social acceptance of gingers in the 21st century, they now walk amoung us 'fully-grown'. With the beard however, a greater ram is downward throat. Growing a beard requires dedication and lots of extra manly hard work. Moses only accomplished his beast beard after forty years in the desert. Here's how to do it in a series of steps that may eventually become a stairway. Shaving is to your beard what tilling the soil is to gardening. Shave a lot. Shave all the time. Shave every day, and twice on Tuesdays, or three times on Saturdays if a member of the Russian Orthodox Church. Once your face is clean shaven nearly every day, you wait, while continuing to shave and pray. One day, a beard will magically be birthed from your face by the beard seeds that have been dropped by birds flying overhead.